The signs are difficult to ignore: Inequality is worsening in the United States, and our health is paying the price. But what can companies do about it? Now is the time to frame investment in health in a way businesses can justify to their shareholders. Companies must tackle three main conflicts that impact their competitiveness and long-term sustainability. 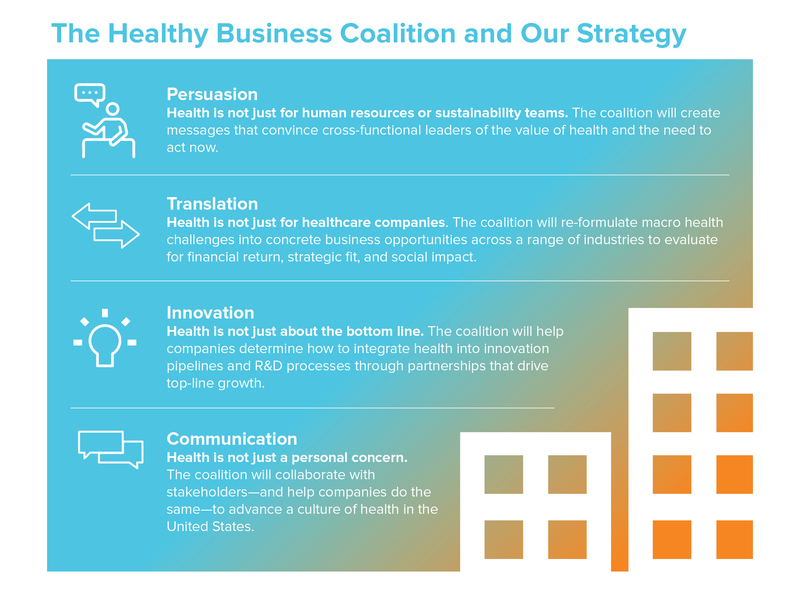 Led by BSR’s Healthy Business Coalition, in partnership with the Robert Wood Johnson Foundation and member companies, our new strategy aims to help companies address these conflicts to improve health and drive business success. We have already begun to see the debates emerge about who is responsible for health. First, businesses are at odds with employees about the management of employee health and financing of healthcare. It is well documented that employee and employer contributions to health plans have more than doubled, putting pressure on both. As a result, employees receive lower wages and lower disposable income, constraining their upward economic mobility. And in an effort to cut costs further, some companies have begun monitoring employees to predict health outcomes and incentivize healthy lifestyles, in effect penalizing those with higher health risks. Such practices carry privacy concerns and raise questions about compliance with the Americans with Disabilities Act, as The Wall Street Journal recently reported. Next, businesses clash with other businesses to attract and retain the most qualified employees. Data privacy concerns aside, employees are more engaged and committed to companies with strong cultures of health, and they expect health-related benefits. Such engagement leads to fewer safety incidents and higher customer satisfaction, employee productivity, and company profitability, according to a Gallup study. If companies want to cut long-term costs while growing their pool of healthy employees, they must successfully compete for new talent on the basis of a healthy, active corporate culture. Finally, businesses and government disagree about who shoulders how much of the burden. As wages continue to decline, out-of-pocket spend on health increases, and disease burdens worsen in unequal ways, we will see greater patient advocacy for affordable, innovative products and services. Companies’ profit margins will undoubtedly be challenged in this context. One need look no further than the pharmaceutical industry, which has experienced a series of public-relations issues in recent years related to pricing and political pressures. Companies will increasingly see political and civil society pressure to change their ways of working and will potentially be forced to accept lower levels of profitability to make health-related products, services, and programs more affordable. These three unavoidable clashes are real, not imagined. So where does this leave the private sector, and what can companies do about it? The clashes listed above can be filtered into four basic questions. By answering these questions, companies can take necessary steps to positively contribute to improving health in the United States. First, how do companies convince decision-makers to invest more in health? Although an abundance of evidence illustrates the problems above, many businesses are reluctant to invest in employee, customer, and community health. Typically, executives in decision-making roles require robust return-on-investment calculations, which show expected payoffs and payback periods, in order to evaluate projects against other competing investments. In many cases, traditional health-related projects lack attractive returns in the short or medium term, which means they will likely go unfunded. Next, how do companies select the health issues that align with their sustainability and corporate strategies? Deciding which issues matter to employees, customers, and communities and then linking those with corporate priorities is difficult. In our research, we have learned that numerous health outcomes are determined by other social, cultural, financial, environmental, and lifestyle factors. Executives with less experience on these issues require guidance to understand which investments will deliver the most return financially and the most impact on health. Third, how do companies innovate new products, services, or programs that advance their health priorities? Once a company has decided to address health challenges, it must then tackle the challenges of selecting the right partners and organizing the company to innovate. Managers may need to tweak R&D systems, create new business-development processes, and engage with partners that have complementary resources and skills. These changes require a new set of skills that are not always widely available. Finally, how do companies engage stakeholders on their goals, progress, and obstacles? The public-relations challenge is as important to manage as any other challenge that companies face. In some cases, companies are not aware of which key opinion leaders and groups they should engage. In many other cases, they simply do not know how to engage. Compounding this issue, transparency in general—and around health specifically—is difficult for large organizations. In light of this context, BSR and the Healthy Business Coalition are partnering with our member companies in consumer products and retail; food, beverage, and agriculture; healthcare; and information and communications technology to advance a coordinated strategy on health. We will provide businesses with a ready-to-implement roadmap to advance health within their organizations and, more broadly, in the communities they serve. The private sector has long wrestled with its responsibilities to address health and the factors impacting health. Without a proactive stance, companies tolerate enormous risks by yielding to the three clashes articulated at the beginning of this article. The Healthy Business Coalition aims to bring clarity to the issues, helping companies define their scope of responsibility and then drive improvements in a way that promotes business success. Importantly, no single party is responsible for “solving” the health crisis and corresponding inequality issues. Companies represent one part of a wider, systemic solution involving families, communities, civil society, policymakers, and lawmakers. We invite companies to explore their role in this solution by getting involved with the Healthy Business Coalition and supporting our work to create communications, tools, and a supportive network of companies, all to cultivate healthier employees, customers, and communities in the United States. To learn more about the Healthy Business Coalition, support our strategy, and help build a healthier future, please visit the new Healthy Business Coalition website and contact us.